I just wanted to let you guys know there won't be any updates this week! My parents are here in the States for my commencement (on Monday! What to wear! What makeup! How should I do my hair!) and I'm being the dutiful tour guide. 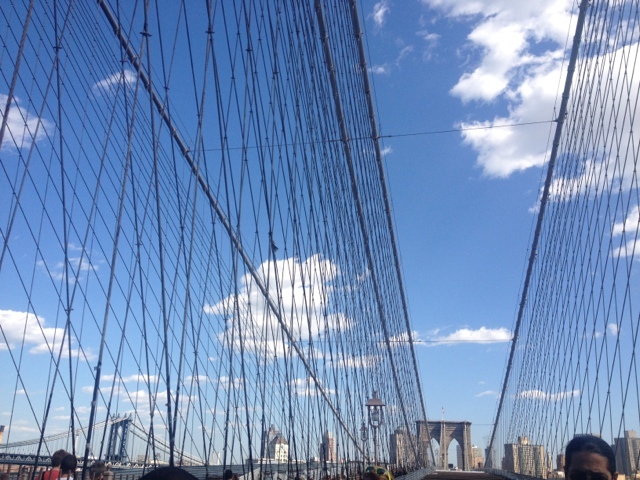 Just before that picture was taken, we were on the Brooklyn Bridge, smiling into the sun. I hope you guys have a great week ahead while my family conquers the Northeast! Hurray! Have fun! :D As for lips - pick something not fussy! WOOHOO!! Chizeled Cheekz's grad!! Congrats!! Have fun!! I'll be clapping and cheering from home! congrats to you (and your film maker boyfriend?)! have fun commencing :) makes for a nostalgic time! where in the northeast are you bringing your parents? Whatever you do, DONT wear 5 inches of heels. I was soo scared I'd trip over the stage with 5000 people looking at me.